There was some epic pooped-out-ness yesterday. Then, I managed to stay up until after midnight watching Sister Wives, because I’m still on west coast time. And then in a fit of good intention, I got up at 6:30 to go to the pilates mat class offered by the gym. Suffice it to say, I’m a little tired. Which is the perfect time to talk about wearing pyjamas and pretending they’re clothes. This little nightie has mushrooms on it! The hemline is long enough (just barely above the knee) to be unscandalous. 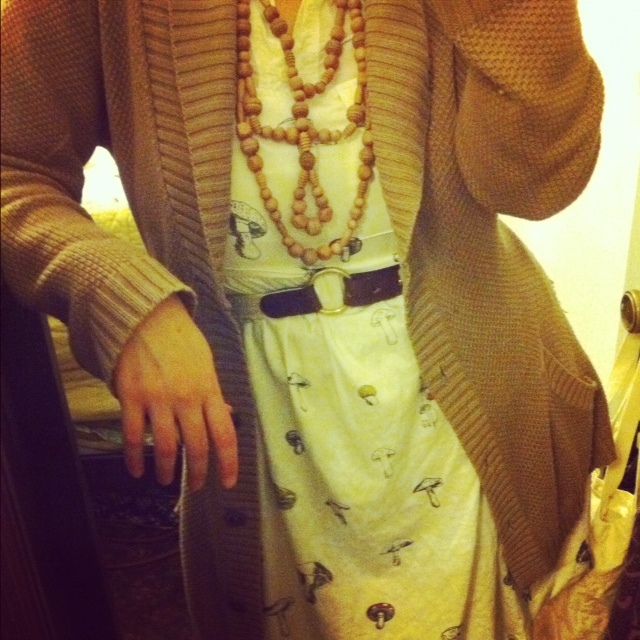 Paired with a belt, long cardigan and a chunky, wooden necklace, and I think it totally works. Of course it totally works. You pull it off. I wear pajamas to work all the time, but then again, my work consists of laundry and carpool. I love this!! You look adorable.